Flyball changed Lily's life. Lily was in foster care after a rough start in life. She is a lively lab, possibly border collie mix. Her rescue organzation, Big Dogs Big Hearts decided to put her in flyball lessons. She was a natural. She loves flyball and learned to do the basics very quickly. She was adopted by the team captain who fell in love with her about the first time she laid eyes on her. Lily has proven herself in the flyball ring. 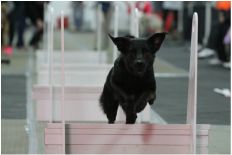 She has run in 13 tournaments (including CanAM) and earned 6 flyball titles thus far. She runs well at start position (average start time 4.2). At home she loves to play in the yard with her sisters, Penny and Zoe. She also loves her little brother, Henry, and they get into all kinds of mischief together. Although Lily loved flyball, it was discovered that she was suffering from moderate hip dysplasia. She was retired in early 2015. She continues to remain active volunteering at Ontario ARC. She swims at CoolBlue Conditioning once a week, and still enjoys getting into mischief at home with her little brother Henry.